When planning your Costa Rica vacation, where you stay is probably the most important part of your trip. You can find everything from rustic lodges totally off the grid to luxury hotels and condos to all-inclusive resorts. Your choice really depends on the type of trip you want. 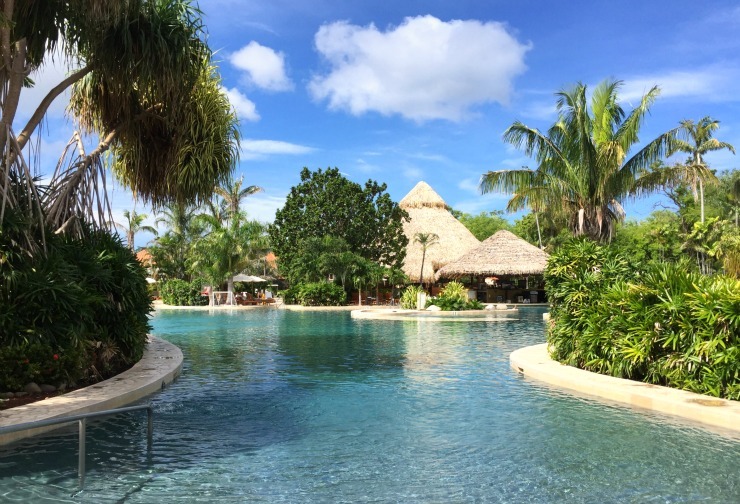 If you’re a family looking for an all-inclusive Costa Rica resort with luxury amenities and a little adventure on the side, I would suggest the Westin Playa Conchal. 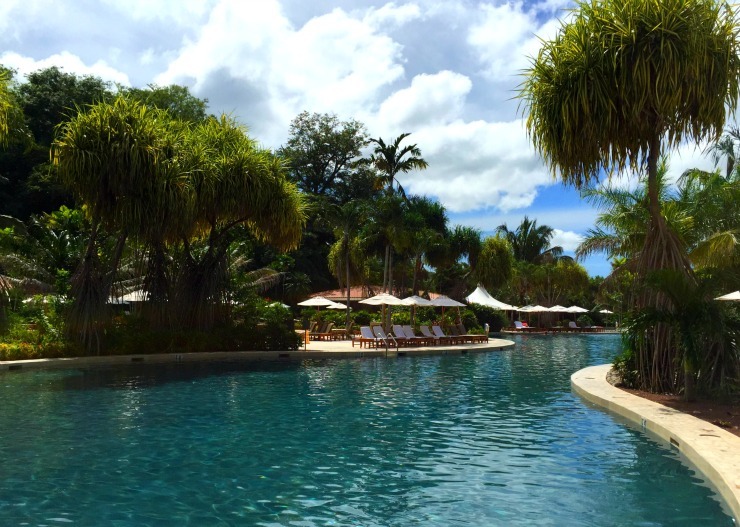 I have been to a few other all-inclusive resorts in Guanacaste and while I like each one for different amenities, I believe the Westin Playa Conchal is the best choice for its location, beach, food and service. The Westin Playa Conchal is an all-inclusive resort sitting right on Playa Conchal, one of the most beautiful beaches in Guanacaste, Costa Rica. Only about an hour drive from the Liberia airport on a fully paved road, you can rent a car and feel safe getting there very easily — yes, I recommend you rent a car so you can explore the other areas nearby. If you don’t rent a car, don’t worry; the Westin has plenty of shuttles that will take you to some of these other nearby destinations as well. The one thing I don’t like about all-inclusives is sometimes you feel a bit locked in, and it’s difficult to get out and explore the area around you. Other all-inclusives are literally tucked away from everything, and it takes too long or too much effort to get off the resort. The Westin Playa Conchal is not like that and happens to sit in the middle of so many other beautiful things to see and do. 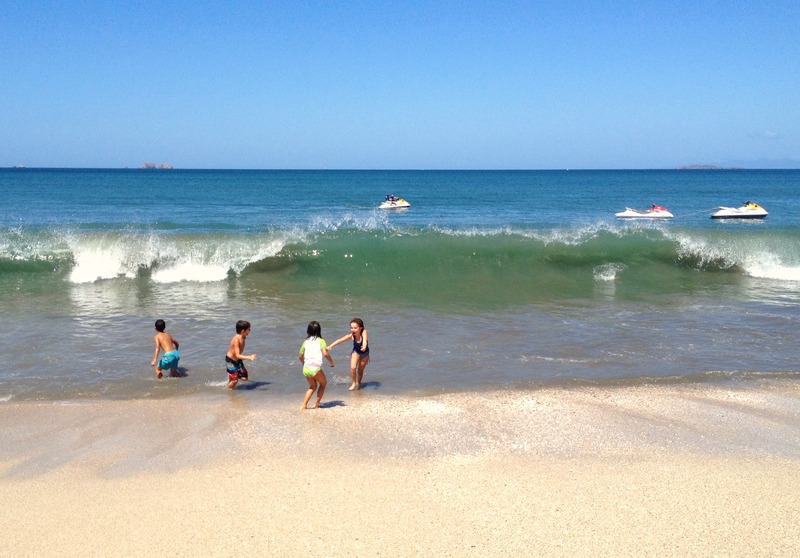 The Westin is only about a 20-minute drive — or shuttle ride — to the popular surf town of Tamarindo, where you can take surf lessons, get out on a catamaran, shop and visit many local restaurants and bars. The Westin is also just about a 10-minute drive to Playa Flamingo, another favorite beach of ours. If you’re looking for a bit more adventure, I highly recommend taking a drive out to Las Catalinas at Playa Danta. This is a great day trip from the Westin, where you can experience the hiking trails either by foot or by mountain bike. You can rent mountain bikes, stand up paddle boards and kayaks from Pura Vida Ride. Las Catalinas has swings and some beach activities for the kids and the restaurant Limonada is a great place to grab a cold beer or a mojito and some fresh ceviche or fish tacos. For one last stop, just a short five minute drive away from the Westin is The Club at Mar Vista, where you must go and watch the sunset while sitting in their infinity pool. It’s a local favorite and the shuttles at the Westin will drive and pick you up for a small charge. If you’re looking for one of the best beaches in Costa Rica, Playa Conchal definitely tops the list. 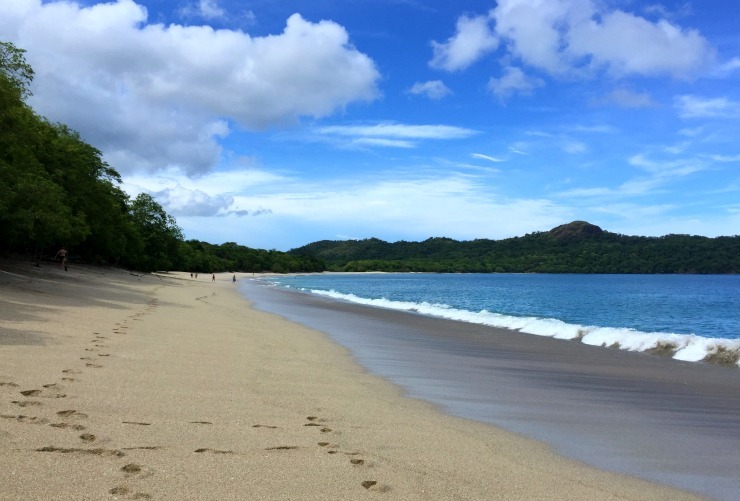 We’re lucky enough to live about 10 minutes from this gorgeous stretch of sand, and it’s one of our favorite beaches in Guanacaste. Playa Conchal translates to “shell beach” and has this name because a large portion of this beach isn’t sand, but broken up pieces of shells. 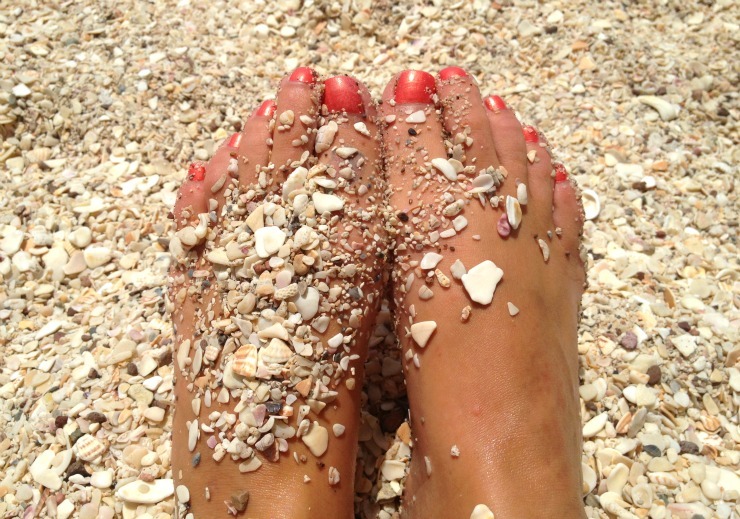 On the north end of the beach, the broken shells are very large and it can even hurt a bit to walk on them, but as you walk south they get smaller and smaller, turning into very small specs of shells and eventually into white sand. Playa Conchal is also the whitest sand beach you’ll find in the area. On most beaches in Costa Rica, the sand is a bit more brown then people might expect. All beaches in Costa Rica are public, so anyone can visit Playa Conchal, but it is a difficult beach to get to, and the Westin Playa Conchal is the only hotel with direct access to Playa Conchal. This helps keep the crowds down. However, during local holiday weekends the beaches here can get busy with Costa Rican families driving up to escape the city of San Jose. They provide beach chairs for all their guests and you can rent snorkel equipment, kayaks, mountain bikes and jet skis from the resort’s activity desk — located right next to the entrance to the beach. Just outside the Westin you’ll see some vendors selling clothing, jewelry and small gifts. 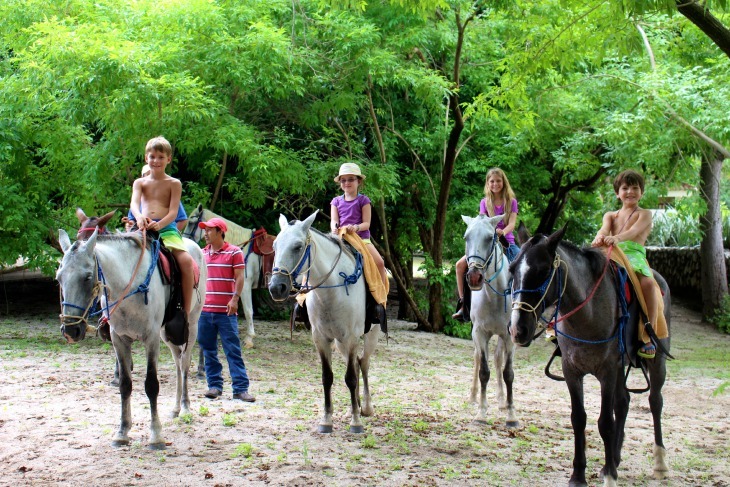 You might even see men with horses; they’re available to take you horseback riding on Playa Conchal. They charge a very fair price but you can always try to get a little discount, too. You can set this up directly with the Westin’s activity desk if you want a specific day and time. One of my favorite things to do on the beach is take advantage of the $20 massage from the local ladies, they have tables set under the trees in the shade, and you can’t beat the price! There is one large pool, and it’s actually shaped like a turtle if viewed from up in the sky. The shape of this pool means it’s a bit more lagoon style, with plenty of different areas and different depths. There’s a swim up bar under a big palapa and a volleyball net for guests who want a bit more activity in the pool. Young children can have floatations devices in the pool, and there is plenty of shade and umbrellas to get out of the sun. I stayed here for a long weekend while I hosted the ROAR Retreat, and the service was exceptional. The entire staff from the maid service, room service and restaurants to the general staff around the pool were all very friendly and courteous. The staff was always smiling and expressing that “pura vida” attitude and feeling. Everyone who attended the retreat told me the service was outstanding as well, so it wasn’t just me getting a little extra attention — everyone genuinely felt like the service was fabulous! 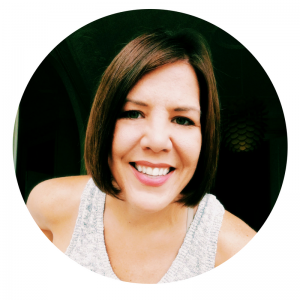 You can certainly practice your Spanish with the staff, but if you don’t know any other word in Spanish than “Hola!” don’t worry — the staff knows english very well. The Westin has some of the best food I have had at an all-inclusive resort, ever. 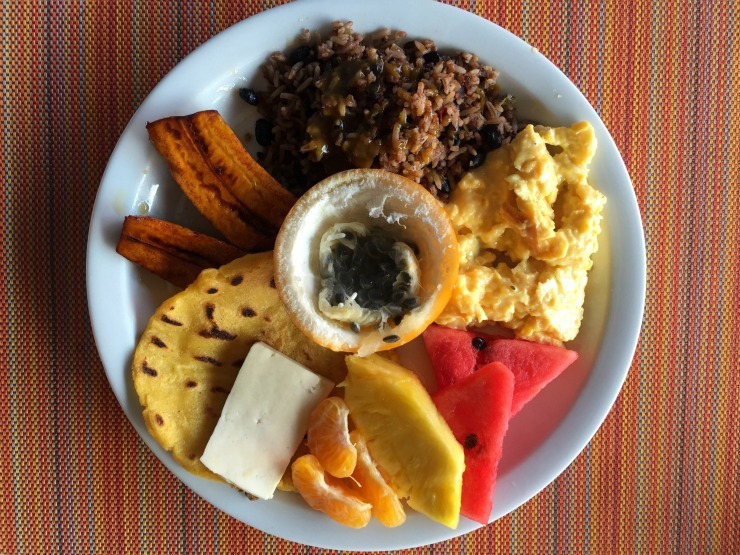 Living in Costa Rica, I know that the food here can be pretty bland and nothing that spectacular, so I was very impressed with the Westin’s variety of options and assortment, particularly at the Mitra International Buffet which serves their buffet style breakfast, lunch and dinner. We also had two incredible dinners at both the Catalina’s restaurant and the Faisanela Italian restaurant: delicious food and excellent service! They have a number of other restaurants on the property as well, but some are only open seasonly. The rooms here are not like other all-inclusive hotels you might find, which I really like. Instead of a huge building with hallways and elevators, every suite is located in a small building with only a total of four suites. 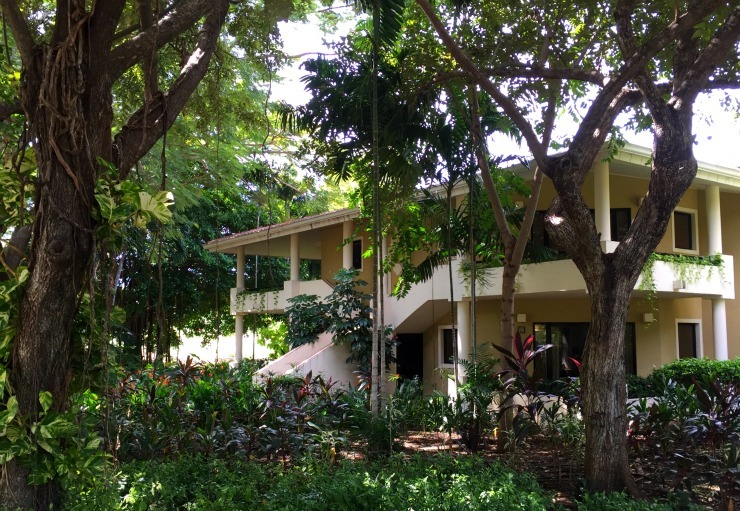 They’re modern bungalows surrounded by lush greenery and beautiful landscaping. Every room also has a nice size balcony or porch for relaxing and you can have your double doors wide open for a nice breeze into your room — as long as it’s not too hot, of course. All of the rooms are suites that come with a sitting area, desk and kitchenette. The refrigerator is restocked every day with water and soda. Room service is also all- inclusive, and you can order anytime throughout the day. The property is large and can get a bit confusing when walking around or trying to find your room, but they have golf carts driving around all day, so you can ask for directions or jump in and they will take you where you want to go. The Westin Playa Conchal also has an 18 hole Golf Course, Luxury Spa, Tennis Courts and a Kids Club. Staying at an all-inclusive does not mean you are stuck on the property, but the Westin Play Conchal is not a bad property to be stuck on either! They are happy to help you with any excursions or tours and have shuttles onsite willing to take you anywhere in the area. As I mentioned, I have been to a few other all-inclusive resorts in the area and while it’s always hard to choose a favorite because each has their own special amenities. 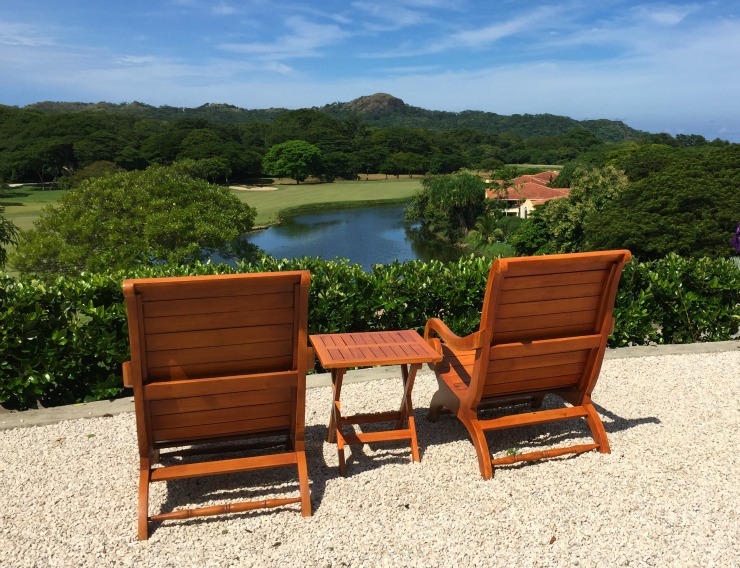 I do think the Westin Playa Conchal is the choice if you want to stay in this area of Guanacaste and have an easy time getting out to explore a little bit more! Disclosure: I stayed at the Westin Playa Conchal as a paying guest, but did work with their events team for a retreat I co-hosted and received a group rate. 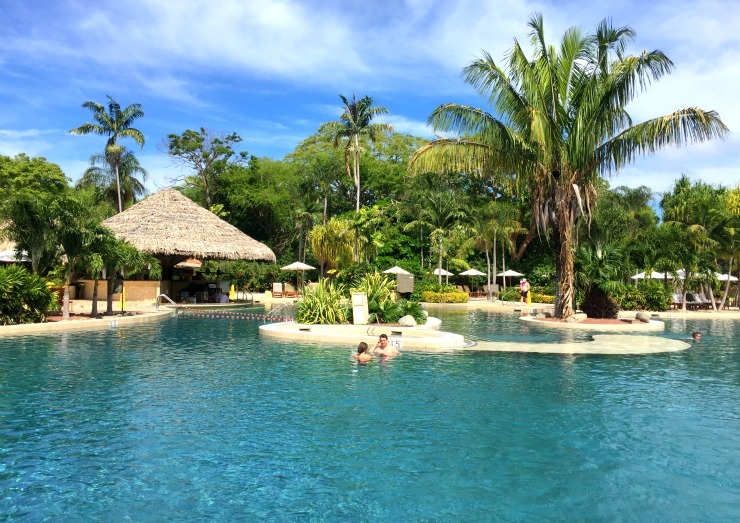 I also live in Costa Rica and have experienced the Westin beach Club amenities and have been to playa conchal many, many times and have always had a great time. I highly recommend this beach to anyone that comes to Guanacaste.